As he kicks back to catch up on his reading list, we reflect how former United States President Barack Obama’s love of books influenced his life. 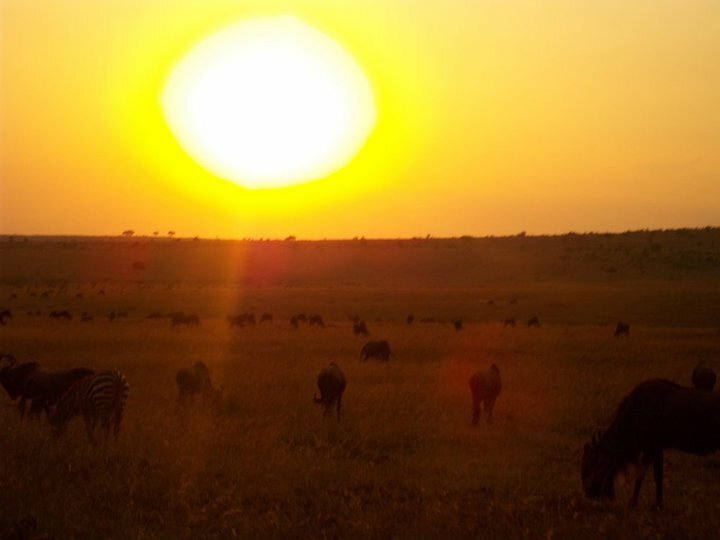 Our Reading Revolution has started to go global, and it’s time to round off the week in reading with a couple of reading related stories from around the world. In Turkey, a real Reading Revolution is emerging amidst scenes of unrest – the Taksim Square Book Club has formed, thanks to the example of the ‘Standing Man’ a.k.a. Turkish performance artist Erdem Gunduz, who stood silently, hands in pockets, for eight hours. People have taken this stance and merged it with the reading and informational activities active since the earliest days of the Taksim Square protests to adopt a new form of reading resistance. The book choices – including Nineteen Eighty Four by George Orwell, Leaf Storm by Gabriel Garcia Marquez and The Myth of Sisyphus by French author Albert Camus – reflect the feelings and attitudes of those protesting, coming as a great show of quiet contemplation coupled with social awareness and a desire to change. 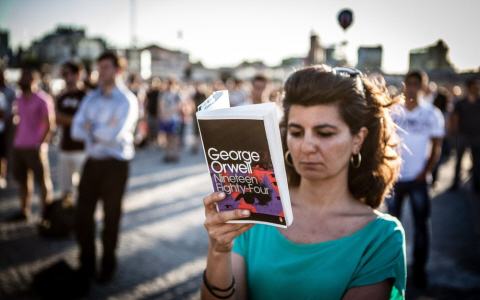 Read more and see pictures from the Taksim Square Book Club on Book Patrol and Al Jazeera. Over in Colombia, schoolteacher Luis Soriano has become a reading hero, along with his two donkeys, Alfa and Beto. 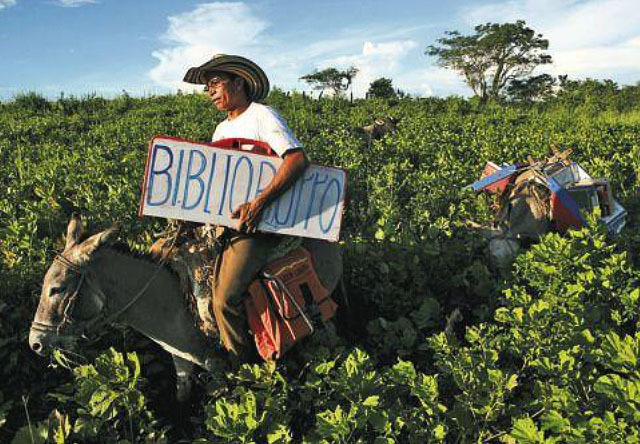 Together they make up the Biblioburro – a travelling library which brings books far and wide, into some of the poorest rural villages of the Magdalena Department. Biblioburro has been operating since 1990, when Luis was inspired to set it up after witnessing the power literature had on his students, many who had experienced conflict at an early age. Starting with 70 books, Biblioburro now has a selection of 4,200 titles, housed in a free library that Luis and his wife Diana built next to their home. Only three volumes have gone missing from Bibiloburro in all this time – and it continues to receive donations from all four corners of the world. Find out more about Biblioburro – if you speak Spanish! – on the Biblioburro Facebook page. Do you know of any other incredible literature projects from around the world? We’d love to hear about them – leave a comment, Tweet or Facebook us. Six of the top writers from the Low Countries are coming to the UK next week for an unusual literary tour – they will be visiting six cities in six days, showcasing some of the best-selling prize winning literature from Flanders and the Netherlands in English translation. The authors will be performing together for the first time, providing the opportunity to discover exciting new writing and ideas from some of the most talented Dutch language storytellers. 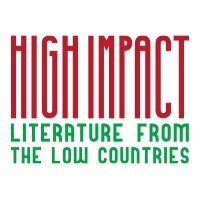 The ‘Low Countries Literati’ include: Ramsey Nasr, the Dutch Poet Laureate; Peter Terrin, 2012 winner of the AKO Literature prize; graphic novelist Judith Vanistendael; historian and essayist Geert Mak; Chika Unigwe, Nigerian-born poet; Herman Koch, author of The Dinner; and travel writer Lieve Joris. Beginning in Oxford on Monday 14th January, the tour visits Birmingham, Liverpool, Sheffield and Norwich, before concluding in London on Saturday 19th, where UK writers Tracy Chevalier, Deborah Moggach and David Mitchell will join their fellow authors for the final gala event. Tickets are available for the Liverpool event on Wednesday 16th January via the Epstein Theatre box office in Hanover Street, by calling 0844 888 4411, or via the Epstein website. All Get Into Reading members can purchase tickets for this performance at the concessionary rate of £5 (plus booking fee online/over the phone) by quoting ‘Reader’ when they book. For more information about the tour, the authors, and how to purchase tickets for the other tour dates, please visit the High Impact website. It’s time for us to journey off once again on our trip to take in the Readers of the World. A few weeks ago we got into the Olympic spirit by going to Greece; now we’ll travel across the Mediterranean Sea to Egypt, courtesy of our Communications Intern, Amir Ali. During the summer of 2010 I had the enormous privilege of visiting a childhood friend in his home town of Alexandria. Egypt’s second city, Alexandria has historically been one of the most important ports in history, similar to Liverpool’s Albert Dock at the time of the British Empire. Despite Egypt’s rich and fascinating history, the well-known pharaohs, pyramids and mummies of Ancient Egypt, my knowledge of its literary culture was poor to say the least. Yet in a country whose ancient hieroglyphic script was not deciphered until the discovery of the Rosetta Stone in 1799, and where the very essence of books and literature, papyrus, stems from, I knew that I was in a place with an immense literary tradition waiting to be discovered. I was first taken to the Bibliotheca Alexandrina, one of the largest libraries in the world and certainly the most gargantuan and impressive of buildings that I had ever seen. The library was built as a replacement to the Ancient Library of Alexandria, destroyed in part during the Alexandria War of 48 BC. Housing an enormous collection of works in Arabic, French and English, the architecture of the modern library is breath-taking, with marvellous fountains in the grounds, a spacious and high-tech interior and a glass roof which slopes downwards towards the Mediterranean Sea. Walking through the endless aisles of books, I felt lost in a sea of literature whose inherent value was overwhelming. The layout of the building is open-plan with an angled floor which, if standing at the top, gives you the unusual feeling of looking down on something both extremely special and yet readily accessible. The mixture of people visiting the library, from tourists visiting from across the globe, to local students and businesspeople, gave it an extremely vibrant feel, similar to that of the British Library in London, location of The Reader Organisation’s National Conference 2012. Even more impressive was the room set aside as a permanent exhibition to commemorate the life and work of one of Egypt’s foremost literary and social figures, Dr. Taha Hussein. Blinded at the age of three, Hussein became an author, journalist, academic and politician, most notably fighting for the right to universal education in Egypt. This exhibition at Alexandria Library demonstrates the high esteem in which many literary figures are held in Egyptian society and opened my eyes as to the role literature has played in such a diverse nation. I continued my stay in Egypt looking for English translations of classic Egyptian literature, a quest which I had little success with. Even on my return to the UK I was at a loss as to how to get my hands on these works. Luckily, not too long ago I stumbled across a translation of Alaa Al Aswany’s The Yacoubian Building (or Imarat Ya’qubyan in Arabic) in Waterstones for 99p! 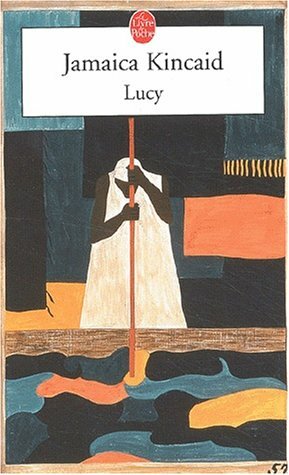 The novel is a relatively modern classic, first published in Egypt in 2002 and translated into English in 2007. Al Aswany’s collage of the various and muddled lives of the different inhabitants of a residential building in Downtown Cairo is in fact a moving and excellently woven tapestry which strips bare Egyptian society. Its influence over modern Egypt has been huge, being made into the largest grossing film in Egyptian cinematic history and being translated into 31 different languages. What is most striking about The Yacoubian Building is its honesty. Al Aswany, a middle class Egyptian from a prominent family, does not hesitate to criticise those who have traditionally gone unquestioned in Egyptian society, and some of his characters, including religious leaders, journalists and even politicians, are particularly deceitful and corrupt. Al Aswany’s novel caused a huge stir at the time of publication and continues to do so today, with many protestors who participated in the Tahrir Square-lead uprising which ousted Hosni Mubarak’s dictatorship citing The Yacoubian Building as the wake-up call which lead to their action. Having said this, the novel is a formidable work of literature whose characters are so believable that they jump out of the page. The extended metaphor of the building as a microcosm of Egyptian society, with its crippling class-system, is one which leaves its mark on the reader. Al Aswany demonstrates with devastating subtlety the revolving doors of society which keep people in their place, often with horrific consequences. For me, The Yacoubian Building is an important example of how art, especially literature, can impact people’s lives in a major way, something which The Reader Organisation is passionate about. I certainly don’t know everything there is to know about Egypt or its literature, but the small amount that I do know is important to me and, I feel, worth sharing. I would encourage you to read some literature, both ancient, modern, and contemporary, which has emerged from a country which is again reshaping itself and finding its own path, just like the blind Taha Hussein did during his lifetime. At the advent of the Olympics of Ancient Greece, which formed the origin of the modern Games, feats in literature ran alongside the sporting activity and ability to compose an ode that would masterfully engage the mind was as highly regarded as great physical prowess. 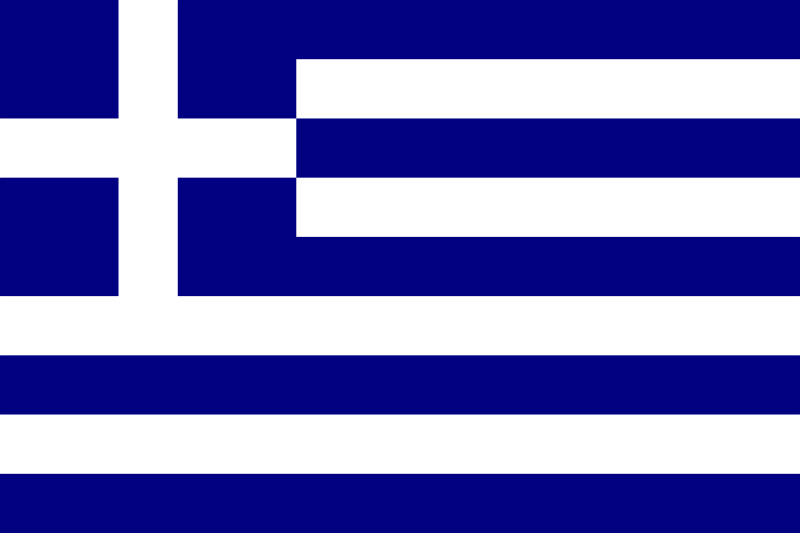 The earliest Olympics consisted somewhat surprisingly of one single event, a 190 metre long sprint, meaning there was much call for other forms of amusement and competition – and literary games featured heavily in the schedule, with battles between poets, writers and philosophers happening across the Olympic site. Away from Olympia the god of poetry, Apollo, was regularly honoured with fiercely fought competitions of verse recital – an Olympic event in reading aloud is one contest we could get especially excited about at The Reader Organisation! Around the same time as the first ancient Olympics took place in the 8th century BC, arguably the most prolific and influential contributor to Greek literature, Homer, composed his epics The Iliad and The Odyssey. The two poems, charting the conflicts, onslaughts, glories and eventual aftermath of the Trojan War as experienced by their major characters the warrior Achilles and celebrated hero Odysseus , are regarded to this day as defining literary works, being translated from Homeric Greek (a particularly literary form of the ancient Greek language, mixing several different dialects) into many modern languages – and being transformed from its oral origins into written text, also. Modern day literature lovers can get some indication of what the ancient Olympics were like by reading these epic poetic works; in The Iliad, Homer dedicates an entire book to the funerary games held in honour of Patroclus, Achilles’ closest companion, which feature chariot racing, boxing, wrestling, running, shotputting, archery and javelin throwing, and closely resemble the Olympic Games in their lively and celebratory nature, although the prizes for the victors were quite unconventional; instead of receiving medals, competitors were given such spoils as a cauldron, a two-handled urn and a six year old mare (which definitely couldn’t fit on the mantelpiece quite so handily). The showcasing of athletic abilities is also featured in The Odyssey, whereby Odysseus is challenged to prove his worth and bravery against the Phaiakians by undertaking physical activity. Although the characters in both poems allowed themselves to be influenced by the Gods to a far greater degree than any human would today, Homer’s classic works still have many significant lessons to teach, particularly to prospective Olympians, considering themes such as pride being balanced between greatness and ruin and the pursuit of glory as something that long defines. Another Ancient Greek poet, Pindar, was especially famous for connecting the Olympic Games with literature, writing epinikion – victory odes honouring the successes of the athletes in the Ancient Olympics. Such odes would praise winners as ideal representatives of the places they came from, elevating them almost to the status of cult heroes – but would not go so far as to turn them into Gods as hubris was a quality reviled in Ancient Greece, considered as serious as a crime. Pindar was himself revered amongst poets and scholars, and was the first Greek poet to reflect upon the role of poetry in life and culture, although his writing does appear quite unusual to the modern reader. by night, outshines all pride of wealth beside. nor any contest than Olympia greater to sing. Heading closer to current times, a strong literary tradition has continued to flourish in Greece, especially when it comes to poetry. Two of Greece’s most influential and revered modern poets, George Seferis and Odysseas Elytis, received the Nobel Prize in Literature, in 1963 and 1979 respectively. Twice nominated for the prize, but never a recipient, was Kostis Palamas, considered to have been ‘the national poet of Greece’ during the height of his literary career in the 1880s. Palamas played a major part in ensuring the thread between literature and the Olympics remained in place – he wrote the lyrics to the Olympic Hymn, first performed at the inaugural modern Games in 1896 and which has become a central aspect of every Opening Ceremony since 1960. Perhaps the most familiar of all contemporary Greek poets is Constantine P. (C.P) Cavafy – of Greek parentage, even though he was born in Alexandria in Egypt, and spent a great proportion of his adolescent years living in England, specifically in Liverpool, a place he was familiar with given his father’s profession as an importer-exporter. Though his work was largely obscured from the public during his lifetime – preferring to circulate it solely to his close friends – Cavafy went on to be instrumental in reviving Greek poetry to readers across the world. His distinctive style, defined by uncomplicated language and direct delivery, was unlike anything else that had appeared in either Greek or Western European poetry, and so allowed Cavafy to become a hallmark figure in modern literature, creating a poetic dialogue and genre all of his own. However one of his most well-known works, Ithaca, consolidates him firmly alongside his literary ancestors; it was inspired by the journey of none other than Odysseus of The Odyssey, and emphasises to the reader that it is the journey of life and its enjoyment that should be regarded above the final destination – another, perhaps more consolatory, lesson for Olympians-in-waiting from every corner of the globe. 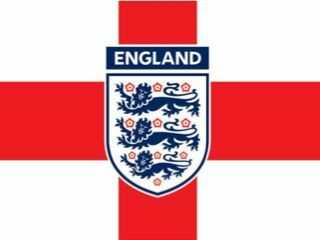 Okay well I guess I just took the opportunity to write about England in this ROTW and some of you might be a bit unhappy that I’m not going to mention Shakespeare, Wordsworth or Dickens and instead I’m talking about Cahill, Walcott and Shwarzer. Okay, so it is not quite as intelligent but still highly valuable in an effort to get some UK kids into reading – which I think is something we can all agree with. The idea of the scheme Premier League Reading Stars is to get children who might not usually engage with reading the chance to develop into avid readers. They do this by downloading a literacy pack from The National Literacy Trust’s website and watching videos were the professional footballers set special ‘reading tasks’ with which the kids must complete to get rewards. 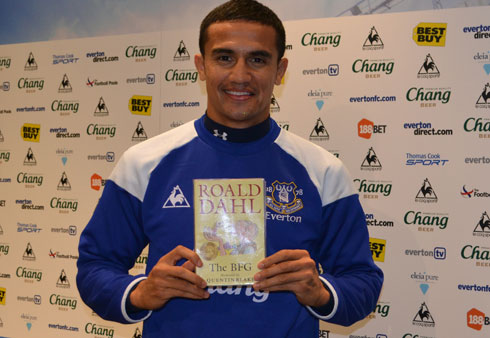 Now I know what you’re thinking, does it really take some of the world’s most disgustingly highly paid football stars to infuse our next generation with a love of reading? In some cases that’s a yes, which is quite sad when the teacher alone should be enough to instil a love of reading in children. An article on The Guardian’s website spoke of a piece of research which pointed to academic standards falling during a major national sporting competition – I’m not usually the one to blindly follow any piece of research just because the men with the money said it was so, but yeah I can understand this statement – I mean from an 11 year old Liverpool lad’s perspective… “Why bother reading miss?” “The footys on! !” < now I can’t say that I entirely blame them as the Euros are real and live, whereas to the kid a bit of literacy hour is drab and dead. So the idea then our oh so constrained teachers is to bring the real, live and exciting tournament in to the world of literature – just like Tom Palmer has with his series of football books and most especially his latest offering called Black Op (almost the same name as the Call of Duty series) (that really popular army game your boy child is most probably playing on as soon as the school bell goes.) Black Op is set in Poland the week before Euro 2012 and brings the world of espionage into the world of football, two things which interest most boys. Though this is probably another stereotyping cop-out surely it’s got to be miles better than these impressionable youths having nothing at all to read? It’s fair and common knowledge that we would rather they were reading some of the greatest, most mind-expanding literature available but to be realistic that’s just not going to happen (at least not at first): it’s all about ‘the hook’. Here at The Reader Organisation we think they are on the right path, as I’m sure our Glasgow based project worker Patrick Fisher has probably read his fair share of football related books with kids and also the Wirral team had a major World Cup 2010 reading drive which was really successful. I think it is really hard in this modern age and we all probably have to jump on the band wagon a bit and at first fight the perceived ‘uncoolness’ of reading before the kids even open a book never mind enjoy it… but then when its actually opened – shhhhh children don’t tell anybody but you might just enjoy it! After you were whisked off to the sunny climes of the West Indies a few weeks ago, why not return to explore some of the islands we couldn’t cram in last time? 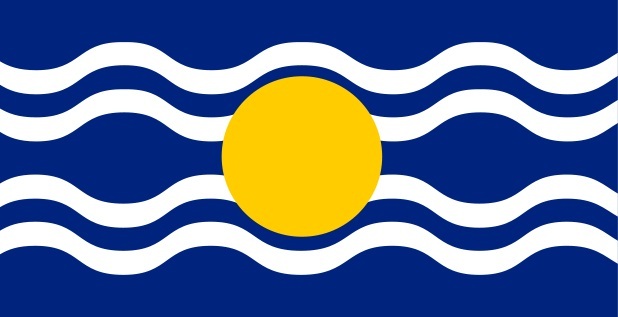 Let’s start with arguably the most famous constituent of the West Indies: Jamaica. 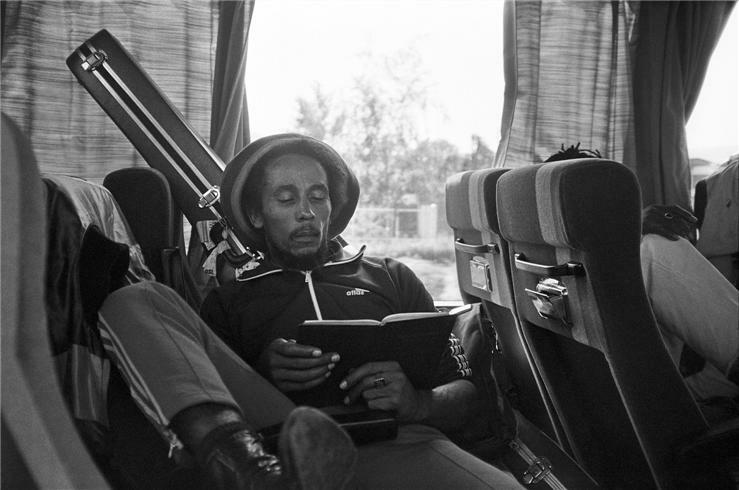 As a nation, Jamaica’s most famous individuals have probably been Bob Marley and Usain Bolt. But what Jamaicans have left their mark on the world of great reading? I hear you ask. Thomas MacDermot’s ‘Becka’s Bukra Baby’ was a literary magazine produced at the advent of modern Caribbean literature sold at cheap prices in a bid to make the reading material accessible and support the contributing authors. Claude Mackay was a famous Jamaican poet, establishing himself at the age of 20 with his book Songs of Jamaica. Mackay flirted with communism before eventually moving to New York, where he was a key figure of the Harlem Renaissance, an early movement promoting black literature. to introduce creative and interactive methods of reading that encourage children to enjoy literature and aids the less fortunate in changing future disparaging lifestyles affected by illiteracy. St Lucia is home to arguably the Caribbean’s most famous writer, Derek Walcott, who went to university in Jamaica. Walcott became the first Caribbean writer to be given the honour of the Nobel Prize in Literature in 1992, two years after writing Omeros, a book inspire by Homer’s famous epics Iliad and Odyssey. Reading Awareness Month has just finished on the island, with the government actively trying to promote reading in response to fears that the nation is one where being a reader is the exception to the rule. “Universal secondary school education was the worse thing to happen to our education system, because it is moving people through the system who are not able to read. Teachers who are unable to teach a child would pass them up and along to other levels, hence the reason there are children in secondary schools who are unable to read,” she [Lucie-Smith] said. When this is discovered, she said, children are treated as if they are the problem when it is the education system at fault. This results in resentment and frustration which may bubble over and result in the child taking it out on people around them. 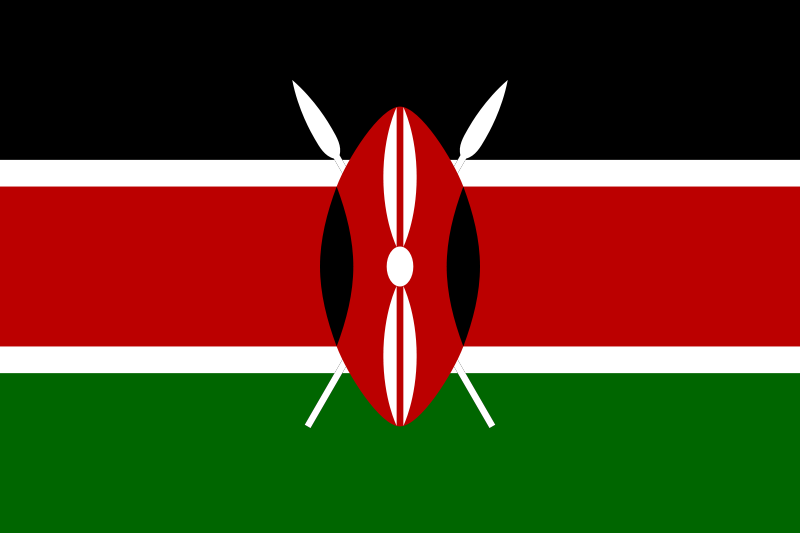 Government and private sector, Lucie-Smith said, were not doing enough to address the problem of literacy. She said companies were generally less willing to improve lower level staff and would seek to get rid of those they discover who are illiterate. Although seemingly having ongoing problems with literacy, Trinidad & Tobago can boast about producing the second Caribbean Nobel Prize winner, VS Naipaul. Naipaul’s more famous works are the Booker winning In a Free State, A Bend in the River, A House for Mr Biswas and Half a Life. The Trinidadian is a somewhat controversial literary figure, ending up in intellectual feuds with Salman Rushdie, and fellow Caribbean, the aforementioned Derek Walcott. But let’s not finish our exploration of the West Indies on a sour note, let’s hear some Dr Seuss read in the Jamaican patois, enjoy! The cricket fans amongst you will know that the West Indies are currently touring England, and the Caribbean islands have brought the world not only some of the most fiery, charismatic sporting figures, but a range of excellent literature. As a side note, cricket fans looking for a good novel to read, and indeed non-cricket fans, should take a look at Netherland by Joseph O’Neill, endorsed by Barack Obama no less. The first of our West Indian destinations is Antigua, who can lay claim to being the birthplace of Jamaica Kincaid, who wrote the acclaimed Lucy which was originally serialized in The New Yorker, and tells the story of a nineteen year old Antiguan au pair who moves to the US and grapples with her cultural identity, represented when she has to recite ‘Daffodils’ by Wordsworth, only to feel fake because she is not English and has never seen a daffodil. The Future for a Child volunteer led initiative in Antigua is encouraging Antiguans to donate books that can be given to children in the country who lack books of their own. Founder, Ina Howe, hopes that by providing deprived children with their own books can help foster a love of reading and improved literacy. She referenced a teacher at Villa, Ms Russell, whom she said got an award for her kids having read the most books from the new school library – which is separate and apart from Future for a Child but helps make the point. “It made a difference that this one teacher was encouraging her kids to read,” Howe said. It goes without saying that this also needs to happen at home. Children, she said, like to talk about what they’ve read and asking them how they liked the book, which characters they liked and so on, is a good conversational starter. In Barbados it would appear that literacy is not such a critical issue, as it can boast a literacy rate at a staggering 99.7%, the 5th best in the world according to a United Nations Development Report in 2011. The most well reknowned writer of Barbados is probably the poet Kamau Brathwaite. His work explores the racial and cultural backgrounds of Caribbeans, particularly the African diaspora, for an exploration of his work, I suggest you read the long, fierce poem ‘Soweto’. The Barbados Association of Reading is cognizant of the empowering nature of literacy to effect positive behavioural changes in people and supports the efforts of the government through the Ministry of Education and Human Resource Development in the provision of educational opportunities from nursery to tertiary level for all citizens of Barbados. BAR events have included the Walk for Literacy where walkers handed out free children’s and adult’s Caribbean literature to passers by; annual conferences and open monthly meetings. …As we all know, books are very important in schools. Books, in fact, are the foundation of any educational system in the world. So for everyone, especially our young people, books are of great educational value. Earlier this month Dominica Public Library celebrated Library Week 2012 with the theme of ‘Building Communities at Your Library’, focusing on how improved community participation in libraries can lead to greater enjoyment of reading. One of the highlights saw library officials visit prisoners for a reading session, an activity that won’t have been a million miles away from The Reader Organisation’s work in criminal justice settings. 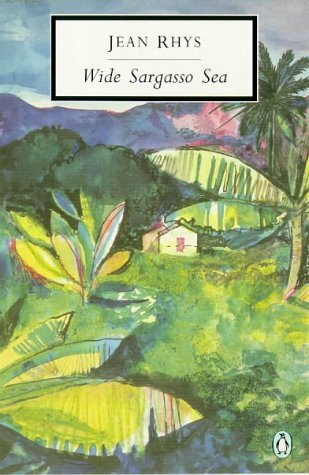 In terms of writers, one Dominican stands out: Jean Rhys. Rhys penned the popular and excellent Wide Sargasso Sea, a post-colonial novel offering a new take on the English classic Jane Eyre. The book acts as a prequel telling the story of Antoinette Cosway, AKA Bertha Mason, and her deeply unhappy relationship with Mr Rochester. Guyana lies on the mainland of South America, yet remains part of the West Indies. Famous writers here include E.R. Braithwaite, Martin Carter, John Agard and Grace Nichols (featured in the forthcoming A Little, Aloud for Children). Before becoming a writer, Braithwaite worked as a social worker for London City Council finding foster homes for children of ethnic minorities, and he was a school teacher. Race is a critical talking point for Braithwaite in his work, with his most famous work To Sir, With Love exploring the challenges faced by black professionals working in 1950s Britain. Literacy rates in Guyana are relatively low compared to the rest of the West Indies, but the Guyana Book Foundation are seeking to address this by ensuring that those who work with youngsters in an educational capacity are aware of the best techniques of teaching reading and writing. So there we have a pick of some of the interesting aspects of West Indian reading and literature, stick around for part two!